Two powerful new Mars rovers have landed on the red planet. With far greater mobility than the 1997 Mars Pathfinder rover Sojourner, these robotic explorers are able to trek up to 100 meters (about 110 yards) across the surface each Martian day. Each rover carries a sophisticated set of instruments that allows it to search for evidence of liquid water that may have been present in the planet’s past. 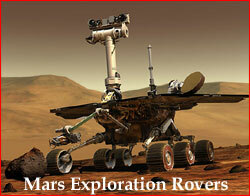 The rovers are identical to each other, but have landed on opposites sides of the planet Mars. The landing for each rover resembled that of the Pathfinder mission. A parachute deployed to slow the spacecraft, rockets fired to slow it further just before impact, and airbags inflated to cushion the landing. Upon reaching the surface, the spacecraft bounced several times, and rolled to a stop on the Martian surface. Spirit rolled to a stop on its base petal, and Opportunity on one of its side petals. Then for each lander, the airbags deflated and retracted, and the petals opened up, bringing the lander to an upright position and revealing the rover. The landed portion of the mission features a design dramatically different from Mars Pathfinder mission. Where Pathfinder had scientific instruments on both the lander and the small Sojourner rover, these larger rovers carry all their instruments with them. Immediately after landing, each rover began reconnaissance of the landing site by taking a 360-degree visible color and infrared image panorama. After leaving the lander, they drive off to begin exploration of their landing sites. Using images and spectra taken daily from the rovers, scientists command the vehicle to go to rock and soil targets of interest and evaluate their composition and their texture at microscopic scales. Initial targets are close to the landing sites, but later targets can be far afield. These rovers will be able to travel almost as far in one Martian day as the Sojourner rover did over its entire lifetime. Rocks and soils will be analyzed with a set of five instruments on each rover, and a special tool called the “RAT,” or rock abrasion tool, will be used to expose fresh rock surfaces for study. Each rover has a mass of nearly 150 kilograms (about 300 pounds) and has a range of up to 100 meters (about 110 yards) per sol, or Martian day. Surface operations will last for at least 90 sols, extending to late May 2004, but could continue longer, depending on the health of the vehicles.